Pilates was developed by Joseph Pilates in the 1920’s and incorporates the best aspects of Eastern and Western exercise disciplines. The Pilates method blends breathing and body position awareness with muscle toning, strengthening and intensity of movement. This assures that the whole body is engaged and being utilized throughout the workout, producing a very flexible and visibly lean body. Pilates Midwest, Inc. opened in 2003 as a facility dedicated to offering the finest certified Pilates instruction in northern Michigan. 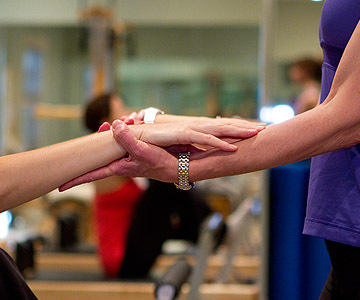 Pilates Midwest offers classical Pilates by 3rd generation teachers with many hours of study with 1st and 2nd generation teachers. We are dedicated to preserving Joe Pilates original work. With a full complement of Pilates equipment, we offer private, semi-private, group mat Pilates and Yoga classes, SpringTone® classes. Visit our clean, friendly and stress free atmosphere at 8930 M-119 Harbor Springs, Michigan .